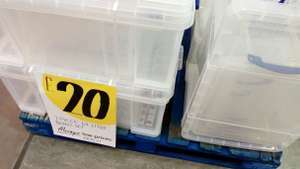 Went into Homebase, Daybook, Nottingham and they had seven really useful boxes for £20. I assume national wide as didn't say manager special or anything. Bought these before at B&Q they amazing value and unlike many they aren't going to shatter they're incredibly strong and the lids lock on too. Bought these before at B&Q they amazing value and unlike many they aren't …Bought these before at B&Q they amazing value and unlike many they aren't going to shatter they're incredibly strong and the lids lock on too.